India's Yogeshwar Singh finished 14th among 18 competitors in the men's individual all-round event final at the Commonwealth Games on Saturday. Nile Wilson of England won the gold, James Hall, also of England, silver and Marios Georgiou of Cyprus the bronze. The 20-year-old Haryana gymnast, who had finished 18th in the qualification round, collected 75.60 points from the six events in the competition. He got 11.40 in floor exercise, 12.25 in pommel horse, 12.60 in rings, 14.10 in vault, 13.00 in parallel bars and 12.25 in high bars. Had he not fallen during the floor exercise he could have finished a few rungs higher. Another Indian, Rakesh Patra will be seen in action in men's rings finals on Sunday. 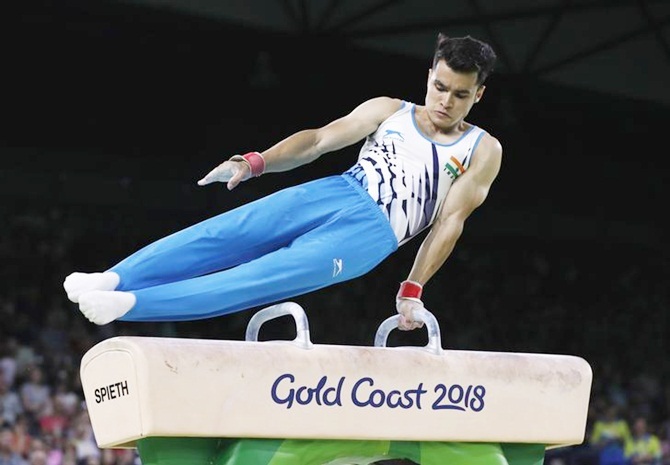 India have just two bronze medals from gymnastics at the Commonwealth Games -- from Ashish Kumar in 2010 at New Delhi and Dipa Karmarkar in 2014 at Glasgow.